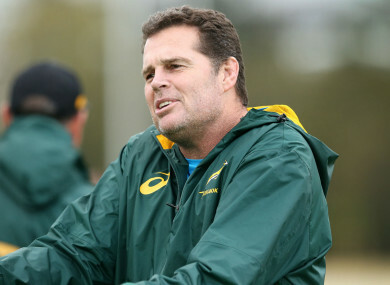 South Africa boss Rassie Erasmus. SOUTH AFRICA DIRECTOR of rugby Rassie Erasmus and his backroom staff will be made available to assist the country’s Super Rugby teams in the 2019 season. SA Rugby announced today that Erasmus, assistant coaches Matt Proudfoot, Mzwandile Stick and Jacques Nienaber, and head of athletic performance Aled Walters can be utilised by the nation’s franchises. The Bulls, the Lions, the Sharks and the Stormers can invite the coaches to join them, with Erasmus believing this will assist South Africa ahead of the 2019 Rugby World Cup. The former Munster boss will join the Bulls for pre-season and said: “We will assist in generic areas, such as skills and conditioning, mauling, scrumming and line-outs. “But it is not our role to have input on selection or gameplan — that can only be determined by the franchise head coach. Email “Erasmus to work with Bulls as Springbok coaches assist Super Rugby sides”. Feedback on “Erasmus to work with Bulls as Springbok coaches assist Super Rugby sides”.